Home › Home and Kitchen › Rechargeable Remote Control Dog Training Collar With Vibration Shock Tone. Wa.. The Downtown Pet Supply remote dog training collar is an excellent tool to help you eliminate unwanted behaviors such as: jumping, barking, biting, chewing, and pulling on the leash. You are in control of how and when behavior corrections are made with our remote training collar. Engineered with the latest advanced technology and safety features you will be equipped with three (3) main modes; vibration (100 levels), static shock (100 levels) and tone. 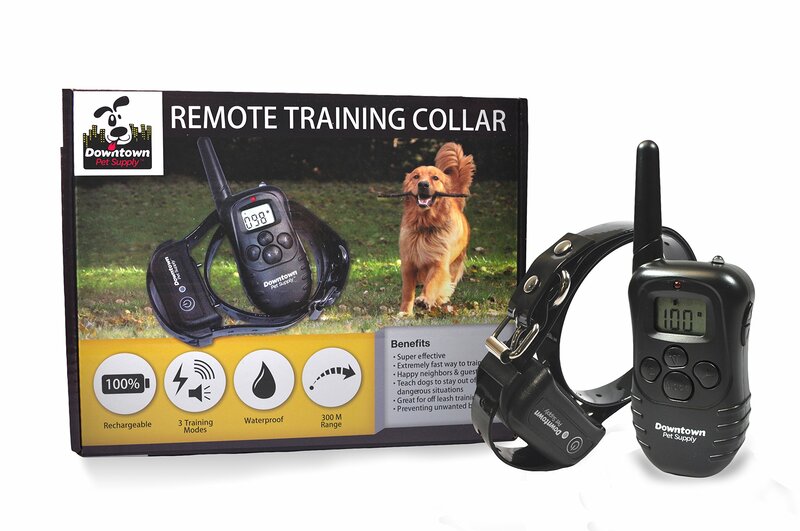 The collar can be fully submerged in water; and it includes a rechargeable receiver and a rechargeable remote transmitter and each has a power save mode to make the charge last. Also includes; two (2) sizes of prongs, short (for shorter coats) and long (for deeper coats), an adjustable TPU belt/collar, and one (1) testing bulb. Benefits; Super effective dog training collar, Extremely fast results, Keeps your pup safe, Happy neighbors & guests, Excellent for off leash training activity and preventing unwanted behaviors.